A Redbud tree burst into so much colour it was almost impossible to focus on one set of flowers. Back in May we let go of Stella, our beloved ACDx. The network our vet clinic is in has a great program. When you let go of a pet you can purchase a tree and participate in a planting ceremony. Faye and I along with about a dozen other people did that today. 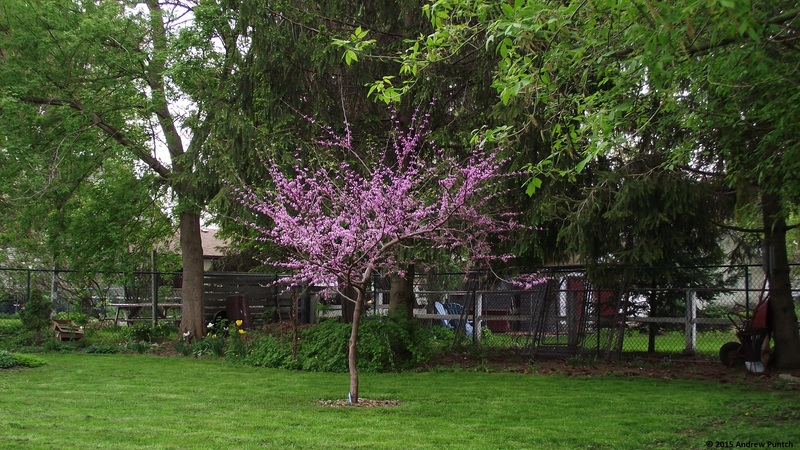 I was able to select a redbud sapling (Cercis canadensis) which two of the techs planted. It seems like a strong young tree and I look forward to watching it grow. I’m unlikely to see it get large and old. That’s fine; this proverb gives me a lot of contentment. A society grows great when old men plant trees whose shade they know they shall never sit in. – Greek proverb. Here’s a photo of us next to Stella’s tree. A welcome rain shower bejewelled a leaf on the redbud tree. Our redbud tree is a tangle of pink. A wet, ‘sticky’ snowfall was caught and held by all it contacted. Our redbud tree became a work of art. The redbud tree adds a wonderful dash of colour to our backyard. It suffered a serious injury three years ago in an accident yet seems to have fully recovered. Our redbud tree was in bloom a couple weeks ago. Our chairs beckoned us to take our ease yet this year the opportunity escaped us. Next year we will correct this oversight.